September 11, 2017 By Tina M Leave a Comment This post may contain affiliate links. Read my disclosure policy here. 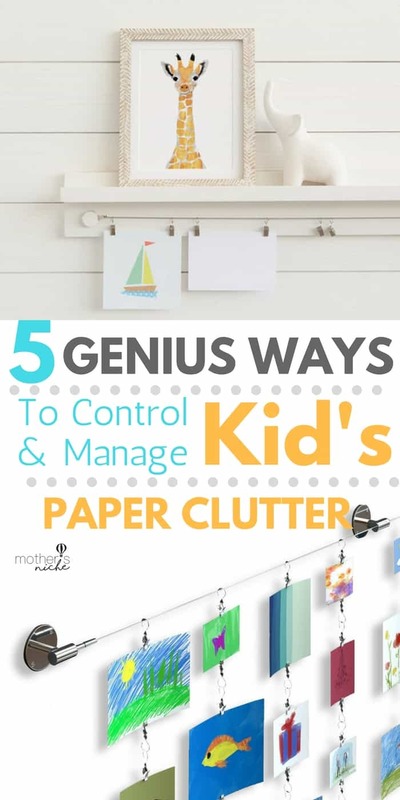 Now that we have covered our genius system for How to Organize Papers (and minimize the paper clutter), Some have asked about how to make a kids art display or how to manage your kid’s paper clutter. Today I want to share a system with you that should help you with all that paper clutter! Home Security Patrol. Think about the airport for a second. Can anything get onto the plane without inspection? NO! The same applies for your home. You are on tidy control! Don’t allow one single piece of paper to enter your home without inspection. Filing System. If the paper does not fit within the parameters of the home filing system that we discussed and outlined, through it out. Kid’s Art. The exception to this is kid’s art. The last thing you want to do with your kid’s art project that they worked so hard on, is to throw it straight into the garbage. Rather, let your child decide what is most prized and special. First, have a kids art display in your home. There are several ideas below, but once you have a system in place, let your child know that there can be “x” amount of art displayed at one time. When something new comes in, they must decide what should come down so that it can take its’ place. You don’t need to tell your child that the old one is going into the garbage, just set it aside and throw it away later. My child has NEVER noticed because I always throw away in the outside garbage. Also, if your child brings something home and leaves it carelessly in the car, or throws it on the floor, this is a good sign that it isn’t cared about too deeply and can be thrown away. NONE of my kids have come back to me and said, “hey…..have you seen my picture that I left in the car?” They simply don’t care unless it’s something they proudly want me to see. The one pictured below is the kids art display I chose for my home (along with a few display cases). These are all super fun! If you want to get the hookes and make your own, that’s an option too! You can get these on Amazon, or sometimes I have seen them in the kid’s section of Jane.com (along with growth charts and all other things cute). 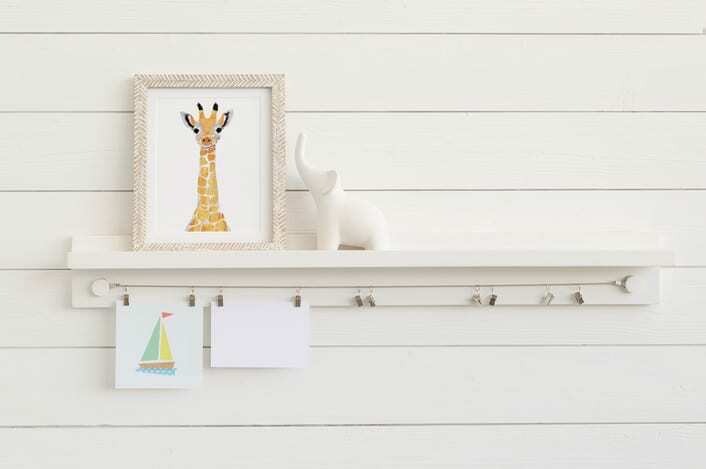 Don’t have the time to make a kids art display and don’t have money to spend on one? No problem! Use some refrigerator magnets and go with the classic fridge art display! Transform Your Life With Our Home Organization Guides! You can also dive more deeply into transforming your organizing abilities with the principles and step-by-step instructions taught in our ebooks! Marie Ricks is a seasoned professional organizer and has been teaching her life-changing skills and habits most of her life. Her live speaking arrangements fill to capacity and her ideas are motivating. 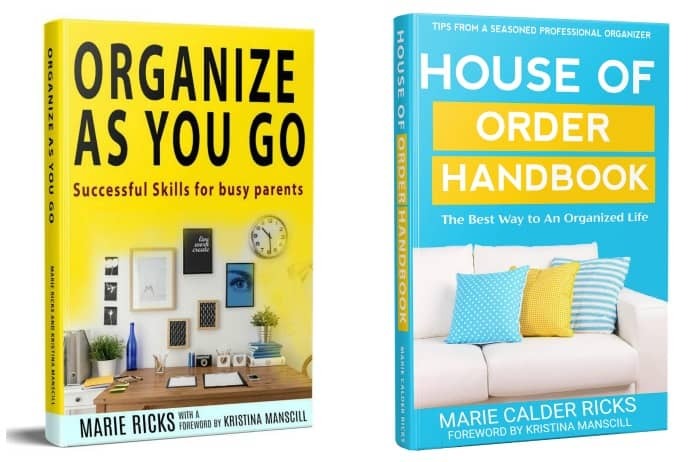 The House of Order Handbook is a step-by-step handbook that guides you to being totally, completely, and wonderfully organized in your personal and family life. This book will help you set up a your personal life so you can function a full 10% better and gain up to 90 minutes every day for the rest of your life. Organize As You Go teaches all the necessary principles and habits to get and STAY organized. The premise of Organize As You Go is that most people have little or no time to stop and get organized. But, if you can be organized even as you take care of personal needs, familial nurturing, and professional responsibilities, you can also find the time to enjoy life! If you want to bring greater organization to a life that just overwhelming and busy; but, you feel held back because you just don’t now how it’s possible, this book is for you. There are changes you can make in your thinking, what you do every day, and how you respond to daily stresses that can make all the difference in your capacity to have an ordered and productive life. Find answers and implement changes with this book!